“Politics for the age of cable TV. Fleeting impressions, an illusion of meaning floating over a sea of undefined emotions. We’re talking about a virtual politics unconnected to any reality, one which redefines reality as itself.” – Kingdom Come (2006). Much is made of the fortuitousness of J.G. Ballard’s writing, yet his skill was as much in noting the aesthetics that would become dominant in everyday life – flat blocks, motorways, consumer goods, violent media, rolling news – as seeing society’s overall future. He was an excellent observer of post-modernity’s seeds being sown. Several of his novels still have the power to unnerve in just how cannily he sets forth a model of the future; a future we are now arguably living through the maelstrom of. In his last period of writing, from Cocaine Nights (1996) through to his final novel Kingdom Come (2006), Ballard sketches out an increasingly accurate and depressing diagnosis for the malaise of a world after 2016. Few actions highlight this feeling of déjà vu more than reading his work whilst on a train heading towards his hometown of Shepperton. Many people make the pilgrimage to Ballard’s art-deco house in Old Charlton Road. The journey to it can be a surreal experience once having read his work, as the inspiration for his novels is in every inch of the Heathrow villages. The landscapes, the glint in the eye of the locals, the sheer aesthetic and bizarre mixture of images all clearly found their way into his fiction. The best J.G. Ballard novel is Shepperton. Vintage cars often pass by, temptingly drawing you into Crash and biplanes fly overhead daring you into Unlimited Dream Companies. The train from central London allowed ample time to read. My choice for this visit was Kingdom Come, one of his most devastating of his novels in terms of the world we’re living in today. Using the Brooklands aerodrome and racing course near Weybridge as a marker to yet again map the psychopathology of Sheppterton and Surrey, he links banal, ubiquitous consumerism with violent, fascist uprisings and racism. 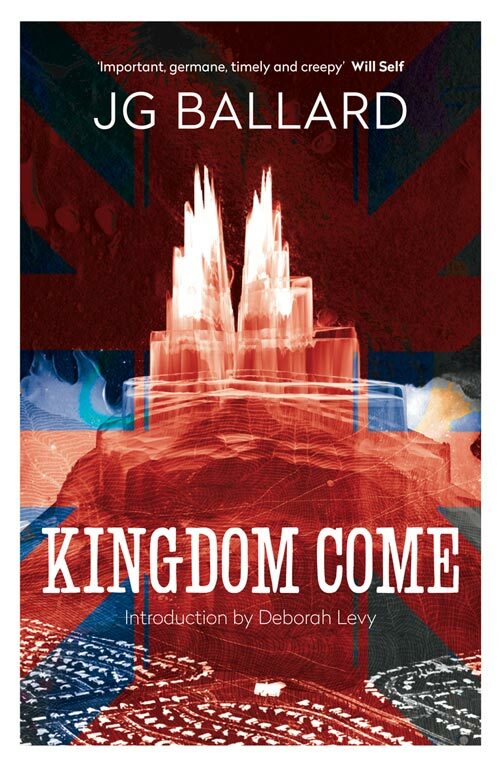 Kingdom Come follows Richard Pearson, a sacked advertising man trying to get to the bottom of his father’s death in a seemingly random terrorist attack on a shopping mall known as the Metro-Centre. Uncovering a wealth of conspiracy, he finds a darker set of needs scuttling behind the St. George’s flags and enthusiasm for brands: namely violence and hatred towards immigrants. Ballard constructs the narrative around the suburban landscape and he can’t help but link its designs with the growing action conducted by the thugs and leaders of the novel. Within a minute of being in Shepperton, the St. George’s flags appeared. Ballard excused an excess of them in his novel by linking them to sporting events of all kinds, sport being the ultimate lifestyle advertisement. In reality, such flag-waving needs little excuse in middle England. Alongside the flags are a number of other markers: pro-Brexit graffiti (“Respect the 52%!”), signs on every door warning of guard dogs or threatening cards dissuading travelling salesman, Neighbourhood Watch zones, and the ever constant noise of the M3 which lies at the top of Ballard’s road. It’s little wonder he was so obsessive with roads and cars; it was there rumbling through the grey atmosphere almost constantly. There’s even the presence of his macabre humour, with the retirement home on the writer’s road now named after him: Ballard Lodge. “I accepted that a new kind of hate had emerged, silent and disciplined, a racism tempered by loyalty cards and PIN numbers. Shopping was now a model of human behaviour, drained of emotion and anger. The decision by the estate-dwellers to reject the imam was an exercise in consumer choice. 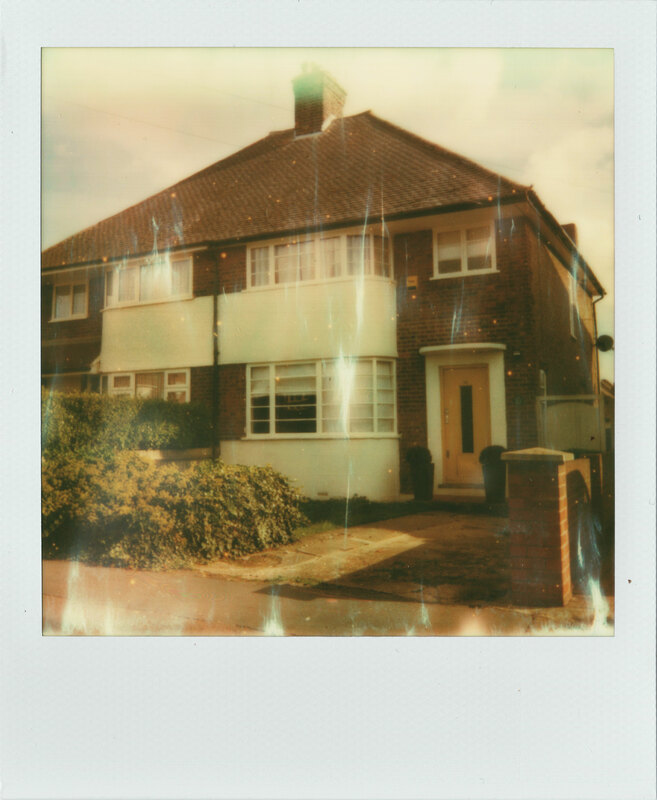 I snapped a Polaroid of Ballard’s house, noting the pleasing scratches that carved their way into the image as it bled into existence. But the visit was one of general, alluring unease, as if some revolution had in fact already taken place in the area; a quiet one which had dangerously spread to other parts of the country. That evening on returning home, the news was rattling its usual hymns of violence, Brexit and hardship. I was finishing the story of Richard Pearson and his search for the reason behind the violence in the shopping centre. Then the news flashed up of a fight in Westfield in Stratford, two people having fallen to the ground from a great height, one seriously and permanently injured. I looked up from the book but, combined with a day out in Shepperton, it made little difference: we are all, to some extent, reading Kingdom Come and won’t be putting it down for quite some time yet.